For over 30 years, Z Best Roofing has provided a wide range of roof repair and maintenance services to the citizens of Long Island. Whether your roof is leaking on a rainy day, bowing under heavy ice and snow, or is in need of new shingles, our team is backed with the experience and knowledge to restore your roof quickly and efficiently. Our team starts the process of repairing leaks in your roof by completing a full evaluation of your roof and gutters, with meticulous attention to detail where you may have noticed leaks. We then find the cause of these leaks and decide upon the proper solution to repair your leaks. Many people do not understand that your roof acts as a shield from the elements. Over the course of its life, it will endure harsh wind, rain, damaging hail, heavy ice and snow deposits, as well as sun damage. 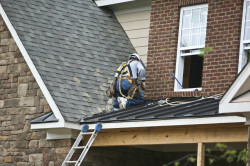 The weather on Long Island can change rapidly, which can cause extensive damage to your roof. Sky lighting is a popular and attractive addition to any home, allowing natural sunlight into your home while protecting your interior from the elements. Unfortunately, skylights were installed using old methods and material, which can break down over the course of the lifetime of your roof. 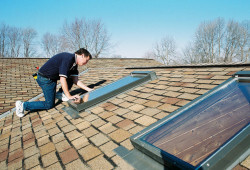 Most homeowners with skylights require repair and maintenance. Tears in your roofs flashing or improper installation may cause many leaks and other damage. These types of repairs can be made quickly and easily, without the need for replacing sections of your roof. 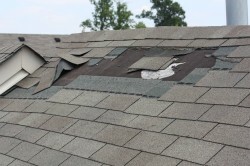 Over the lifespan of your roof, the flashing may become loose and need to be put back into place or changed. Our team can quickly and efficiently examine areas where worn caulking or flashing exists, and repair them quickly.